My neighbor’s house was an Oakland community landmark on Google Earth with its magenta walls and chartreuse trim. It was so pink I always hummed something by The Band, which makes me think about the passing of the great Levon Helm, but that’s another story. All colors fade in the sunshine, even the bright ones, and so the day came when a new coat of paint was required. While most mortals choose the security of pale pastels for their homes, my wonderful neighbors boldly embrace intense, vibrant, juicy color. The two-story domicile now dresses in an azure gown with lime accessories. The transition was a delight. For several days the house was a canvas where a team of painters painted layer upon layer diligently bringing blue to the forefront and quietly pushing the reddish-pink to the background. Daily life was being re-framed through the window. Within borderlines created by ledges and transoms, the colors and shapes were pushing and pulling within a geometric grid recalling one of my favorite painters Richard Diebenkorn. Just a few weeks ago, we saw the Diebenkorn Ocean Park Series exhibit at the Orange County Museum of Art. Initially inspired by the “view” from his studio window, Diebenkorn captured the geography, topography and hazy light inspired by the marine/desert environment of Los Angeles. My love affair with Diebenkorn began over thirty years ago in a course taught by the painter Cornelia Schulz. Captivated and spiritually centered by Diebenkorn’s strong horizontal and vertical bands of color I was inspired to see the world through his framework. Diebenkorn’s painting made me feel it was possible to realize something as close to oneness as can be known. 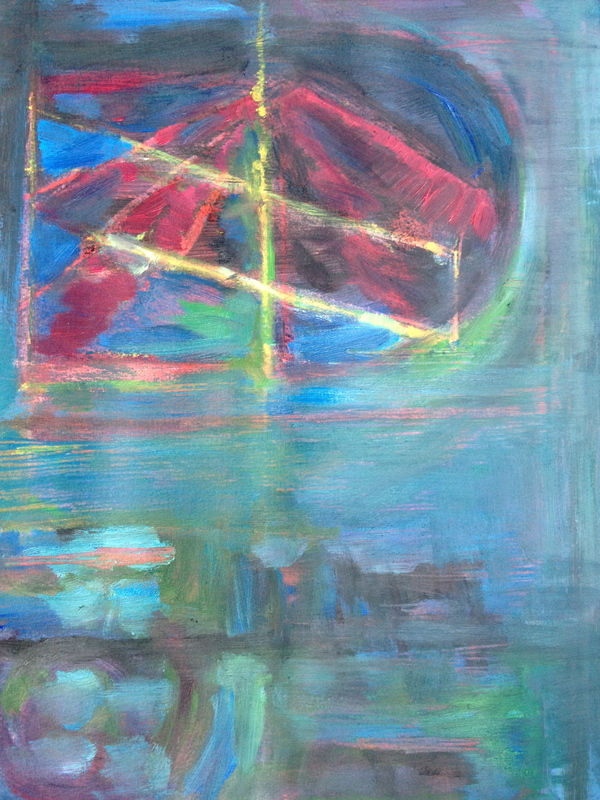 Critiquing my work, Schulz noted my clear interest in the Ocean Park Series and suggested that I seek out Diebenkorn’s inspiration: the abstractions created by Matisse of the “view” from his window during his stay in Morocco and Tangiers. And I did. Last summer San Francisco MOMA hosted the exhibit The Steins Collect which delved deeply into the art collections formed by Gertrude, Michael, Sarah and Leo Stein. Michael and Sarah Stein became great friends with Henri Matisse purchasing many of his paintings. Leaving Paris before the Nazi invasion of Europe, Michael and Sarah Stein settled in Palo Alto, California. After World War II, Richard Diebenkorn, an Art Student at Stanford University, regularly attended the salon’s held by Sarah Stein, where he was first exposed to Matisse’s paintings. In 1964 and 1966 Diebenkorn had the opportunity to see many of the paintings Matisse created in Morocco and Tangiers at the Hermitage in Leningrad and the UCLA Art Gallery Matisse retrospective. In 1967, Diebenkorn moved to Los Angeles and the Ocean Park Series was born.